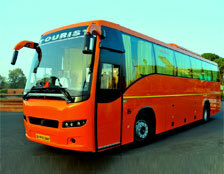 Online Coach rental from Delhi to Agra, Jaipur(Rajasthan) & get best deals on bookings with HTI. Book cheap budget coach rental, Tempo Traveler rental and coach rental for India tour packages, full day and half day also. Hire Taxi India is maintains a finest fleet of Luxury Coaches India, Mini Bus, Tempo Traveler with outstanding passenger comfort and attractive exteriors. We make Luxury bus, tempo traveler, Mini coach available on rent with diverse seating capacity for small and large groups ranging from 12-27 Seater to suit the individual requirements. You can go for an A/C or non A/C Mini coaches. 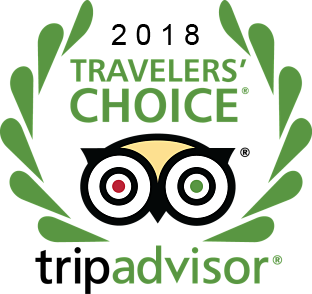 These luxury coaches are with outstanding passenger comfort and attractive exteriors and interiors, offer tourists a comfortable and relaxing journey. 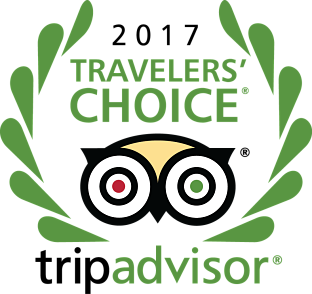 The interiors are later designed by experts according to the choice of travel agents looking up to the needs of clients. The tempo traveller has an extremely powerful engine of more than 2600 CC. Along with the turning radius of this tempo is about 6.5 m which is really very good. The braking system is also great and is perfectly made as per the Indian roads. For a group of 8 to 10 you can book a tempo traveller for your journey. With this you will be able to enjoy your journey as group. It is a perfect option for a group picnic and best to run on Indian roads. 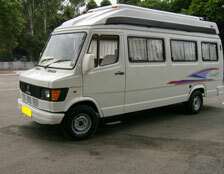 The mini coaches are the best suited vehicles for people who generally travel with a small group. By hiring this vehicle you will get to stay along with the entire group during your journey. You will get both AC and non AC mini coaches to hire. The seating arrangement of the vehicle is the most comfortable of all because of the push back feature. This will give you a comfortable seating for longer journeys. Volvo Coach, One of the most secured & comfortable vehicle for long distance travelling because of its seats. 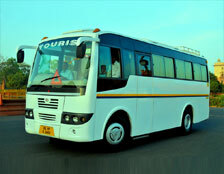 This is a giant bus with great measures for the security of the travellers in big groups of 40 persons. Along with hiring a Volvo bus you will have a driver and a helper. There is also a huge place for the luggage and it can accommodate lots of heavy and huge bags in it. It is very spacious from within and has a great leg space.